A cloth-covered organizer that stores keepsakes in acid-free drawers, files, fabric bags, and envelopes. Where do all the boutonnieres, polaroids, and speeches go after you've said your "I dos"? Please don't say a cardboard box in the attic. Elevate your storage game with this beautiful cloth-covered "library." 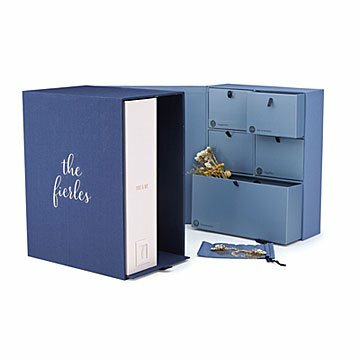 It's a stylish way to store precious keepsakes in acid-free drawers, vertical files, fabric bags, and stitched envelopes. Each is finished with a hand-painted personalization: your first names or your new family name on the front, and an initial on each interior compartment. Send the set to newlyweds, or as an anniversary gift— because it's never too late to ditch the dusty cardboard box. Made in China.